With homestand #1 behind us and the 66ers on the road for the first time in 2011, it’s time for the very first “look back” of the year. We had a chance to unveil each of our nightly promotions in the first seven games against the Quakes and Mavericks, and even threw in a blanket giveaway in between. Fans in the Inland Empire endured less-than-desirable weather to cheer on the 66ers to a 4-3 start to the season, before a seven game road trip in Bakersfield and San Jose. Opening Night. It’s hard to put those two words together without forming a smile on your face. They mean so much more than the start of a baseball season. It’s the real first day of Spring, and the gate that ushers in that unique smell of freshly cut grass and perfect weather. Unfortunately, an odd trend in San Bernardino left us with a chill in the air, but couldn’t derail the excitement of a brand new season at Arrowhead Credit Union Park. Along with it being the first night of the season, it also happened to be a Thursday. Every Thursday this year we’ll feature $1 beer and soda, thanks to JBS Heating & Air who have supplied us with the opportunity to provide our fans with Thirsty Thursday. Everyone knows that ACUP is a place you’ll have the time of your life. But it’s always a little sweeter when the home team puts together a reason to cheer. The 66ers took an early lead in the 2nd inning off the bat of Angels rehabber Reggie Willits’ two-run single, and never looked back. Fellow Angel Scott Downs, who also played for the 66ers on a rehab assignment, took the win that night, leading the 66ers to an Opening Night victory. The first Toyota & Scion of Redlands Fifty Cent Friday of the year gave our fans a chance to see another 66ers win with discounted prices throughout the ballpark. Fifty cent hot dogs and quesadillas, $2.50 beer and admission? You betcha. The 66ers won again Friday night, stretching their record to 2-0 to start the season for the first time since 2003, this time coming from behind twice to win 7-6. It didn’t happen without a little excitement, as the 66ers plated the tying run in the bottom of the 9th with 2 outs, sending the game into extra innings before the Quakes took the lead in the 12th. Then the team that never quits posted two runs in the bottom half of the inning off the bat of Michael Wing to win in walk-off fashion. Fans lined up early for the first of many giveaways this season, as the 66ers handed out sleeved blankets to the first 1,000 in attendance. Unfortunately the early and loud crowd couldn’t help the 66ers to a 3-0 record, as Rancho Cucamonga scored early and often on their way to an 11-6 win over Inland Empire. Luckily for the ones who came in early enough, the blanket giveaway came just in time as temperatures continued to drop and leave baseball fans a little colder than their used to at the old ballpark. There’s not a whole lot better than day baseball, and that’s exactly what fans got last Sunday. Hundreds of kids came out three hours before game time to participate in a skills clinic from 66ers players and coaches, who graciously spent time before the game leading youth in instructional drills. The weather warmed up a little (likely due to the fact we played under the light of the sun), and it became a perfect day for baseball. Los Angeles Dodgers starting pitcher Jon Garland took the mound in a rehab assignment for the Quakes, but was touched for three runs by the younger Single-A hitters of Inland Empire. In a close game, the Quakes held on to push the 66ers record to 2-2, and end the first series with the Quakes by a score of 6-4. The Quakes left town and the Seattle Mariners’ High A Affiliate, the High Desert Mavericks rolled in. If you haven’t heard yet, Mondays were made for YOU, the reader of a blog like this or a follower of us on Twitter or Facebook. Mondays at Arrowhead Credit Union Park will revolve around our social media efforts, appropriately named Social Media Monday. We gave away several tickets to the game, just for those who showed up and mentioned that they followed us on Facebook. We really appreciate those who make our interactive media soar, so the least we could do was invite them to a game. Be on the lookout later for more offers every Monday this season. As for the game, the Mavericks continued the 66ers losing streak, by posting a shutout of Inland Empire 6-0. It was a game to forget for our boys in red, as the offense could only muster up four hits, and was held scoreless for the first time of the young season. Many remember the days when the San Bernardino Spirit ran to their positions at Fiscalini Field. We hope to catch that excitement every Tuesday with VMI Builders Turn Back the Clock Tuesdays at Arrowhead Credit Union Park. 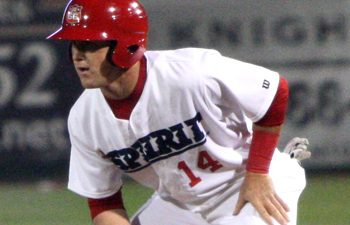 The 66ers and the ballpark alike transformed into the days of the Spirit on Tuesday. The team wore uniforms from the 1987 season, and parking, admission and beer were all only $2. It must’ve been the bright white jerseys with “SPIRIT” across the chest that did it, but the 66ers ended the short losing streak, evening up the record at 3-3. High Desert took an early 1-0 lead, but the 66ers scored in the bottom half of the inning before scoring two more times, winning 3-1. It was a long homestand, but a fun one nonetheless. What else would you expect at Arrowhead Credit Union Park?? Fans from across the Inland Empire brought their pooches into the stadium for our first Bark in the Ballpark. It was one of the more chilly evenings of the first two series, but the 66ers must not have noticed. The offense heated everyone up with seven runs on eight hits, including a four run 5th inning en route to a 7-4 victory. All but one of the 66ers nine starters had a hit, as Jon Townsend increased his batting average to .400 while driving in three runs of his own. We’re expecting a fun season in 2011. If every set of home games is as exciting as the first, you won’t want to miss a pitch at Arrowhead Credit Union Park. 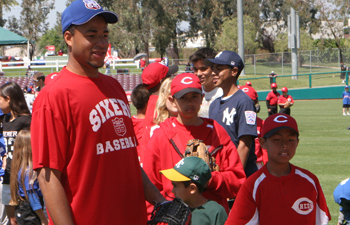 Click on over to 66ers.com or visit us at the box office to get your tickets today!